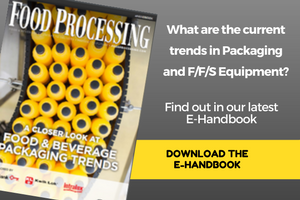 Processors can't get enough flexible packaging, for everything from fruit chips to ready-to-drink (RTD) cocktails. Flexible packaging's light weight and convenience are core drivers, but innovative structures and graphic treatments for pouches, bags and shrink labels are also fueling demand. The shift to flexible packaging is occurring among national brand owners and private labelers, and it's happening domestically as well as overseas. The company's goal was to convey "contemporary, healthy relevance for an increasing savvy and health-seeking [consumer] in the healthy snack category," explains Ian McLean, founder and creative director at McLean Design Inc., Walnut Creek, Calif. McLean's firm designed the new Sunsweet package graphics. "We needed to look awesome and young and relevant and innovative." Like the new label graphics, redesigned graphics on Sunsweet's dried-fruit pouches convey healthfulness and contemporaneity. The pouches are printed via rotogravure, which delivers a high-quality look, and photography on the pouches features the fresh fruits from which the products are made. "If you're selling fresh, healthy and delicious, the quality of the reproduction is everything," McLean says. The product launched in August 2012 and is now in test market in Indianapolis, San Antonio and Seattle. Foods with a high liquid content are showing up more frequently in pouches, as well. For example, Tesco PLC, Cheshunt, England, chose stand-up pouches for Tesco Finest heat-and-serve soups. The premium-quality, private-label soups were previously packaged in cans. Tesco's retorted pouched soup "ties in, in Europe, to what Campbell's did here in the U.S.," says Sal Pellingra, director of innovation at Ampac, Cincinnati, referring to the 2012 launch of Campbell's Go! Soup in pouches (see Pouches Flex Marketing Muscles). He notes that flexible packaging is "a category changer, moving from soups in a can to soups in a pouch." Ampac supplies the Tesco Finest soup pouches. The Tesco pouch represents a technical breakthrough, too: It's printed using a new type of high-definition flexography. Historically, flexographic printing has not been compatible with retort conditions. Retort pouches are typically printed via rotogravure, because this type of printing "puts down a higher density of ink than flexo, in general, so it's more suitable. It holds up under the high pressure and temperature of retort, whereas [conventional] flexo inks physically aren't able to hold up as well," says Pellingra. Ampac's plant in Kirchberg, Switzerland, developed a urethane ink system that solved the problem, paving the way for retort flexo. The result is high-quality graphic reproduction that "looks a lot like roto," Pellingra says. "It's very difficult to tell the difference." In addition to delivering high-quality graphics, which support Tesco Finest's premium positioning, the new flexo printing approach offers cost savings as the number of stock-keeping units (SKUs) in the retort soup line grows. The goal of Sunsweet's pouch redesign was to convey "contemporary, healthy relevance for an increasing savvy and health-seeking [consumer] in the healthy snack category." Those same goals were accomplished with new shrink labels on Sunsweet's prune juice, plum juice and blended-fruit juice bottles. The shrink label protects the juices from light, and the new graphics provide a more appealing view of the product than the juice itself, thanks to photorealistic photography and rotogravure printing. Further, Sunsweet worked with Graham Packaging Co., York, Pa., to create a bottle with a proprietary shape. "The custom bottle in the modern, sleeker, interesting, contemporary shape was a huge move," says Ian McLean, founder and creative director at McLean Design Inc., Walnut Creek, Calif., which designed the bottle. In addition to being visually arresting, the bottle has a nipped-in "waist" that makes it easy to hold and pour from. McLean adds that the bottle's shrink label provides more room for branding, product information, nutritional data and other marketing communications. "The old label is effectively less than half of the real estate of the shrink [label]. So you sell brand better, you sell appetite appeal better, you sell brand trade dress better … and you drive visibility" with the shrink label. "Between the new, modern, plastic bottle and the full-shrink label, it made for a … massive image upgrade … to this really healthy juice that's been around forever," McLean says. Brook & Whittle Ltd., North Branford, Conn., supplies Sunsweet's shrink labels. Interestingly, the Sunsweet logo is printed on an area of the shrink label that covers the bottle's upper bell shape. Thus consumers can see the brand name even if the bottle is merchandised on a lower shelf, because the logo points up. The cost issue relates to the economics of rotogravure printing vs. flexography. Rotogravure cylinders are expensive to manufacture, and amortizing their cost requires large print runs. Flexo plates and other costs are lower. Therefore, flexography is a more economical way to print small runs. Flexographic printing is "better for products with lots of SKUs [and] a lot of changeovers," Pellingra says. He adds that flexo printing that can withstand retorting conditions is "a big deal … and having print quality that's so close to roto is really a bonus." The Tesco Finest soup line currently includes five SKUs, in flavors that include Smoked Haddock Chowder, Cream of Wild Mushroom Soup and British Roast Chicken Soup. Like the Campbell's Go! pouch, Tesco's incorporates a clear bottom gusset through which the product can be seen. RTD pouch cocktails have become a more common sight in recent years, and that trend is accelerating. "Growth has really skyrocketed in the segment in the last two years," says Lisa Coker, chief marketing officer at American Beverage Corp., Verona, Pa.
American Beverage pioneered the frozen pouch cocktails category with its Daily's Cocktails brand in 2005. And although "a lot of other brands have entered the segment, Daily's remains the leader," with greater sales and significantly more cocktail flavors than competitors, Coker says. The company continues to add to its pouch-cocktails portfolio, having recently launched two limited-time seasonal products to complement its seven standard flavors. The seasonal offerings, Daily's Spiced Sangria and Daily's Hard Cider, may be served frozen, chilled or warm. Building momentum, American Beverage will add six new frozen pouch cocktails to its year-round offerings this year. The entrants will include three new light cocktails and three tropical flavors: Bahama Mama, Blue Hawaiian and Hurricane. The roll-out was to start in January. "We've found that for consumers, flavor variety is an aspect that's very important," Coker says. In addition to expanding its product line, the company works with retailers to merchandise the pouch cocktails in ways that encourage trial of the different flavors. Originally sold in single-flavor four-packs, Daily's Cocktails are now sold primarily as single pouches at a $1.99 price point. The switch from multipacks to singles "was something consumers really loved," Coker says. "Obviously there's a lot less risk for trial if you're only charging $1.99 for something, and it allows consumers to mix and match the flavors." American Beverage provides retailers with merchandising tools such as bins, spinner racks, shelf displays and cash register displays that present a variety of flavors while at the same time encouraging impulse purchasing. The 10-oz., single-serving Daily's Cocktails frozen pouches are made using a laminate of polyethylene terephthalate (PET), aluminum and linear low-density polyethylene (LLDPE). The pouches are printed via rotogravure and die-cut into a patented shape. American Beverage fills the pre-made pouches at ambient temperature using filling equipment from Toyo Jidoki Co. Ltd., of Tokyo. Although the filled pouches are shelf stable, they can sometimes be found in the freezer case. "Some retailers, during the summertime in particular, put them in the freezer, and that's a real ‘aha' moment for consumers — all you have to do is throw the pouch in the freezer and then it's ready to drink," Coker says.